The Collapsible Tote box is made of PP Corrugated Plastic and possesses 3R (Reusable, Returnable and Recyclable) and 3S (Saves time, Saves costs, Saves fuel). Its 3R and 3S features make it an environmentally friendly product which greens the overall supply chain. It has both collapsible anad stackable features and can be recycled since it boasts of a 10 years shelf-life. 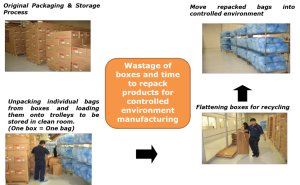 Its functional design serves to boost operational efficiency by eliminating the process of unpacking and repacking of products, which leads to an increase of 2.5 times more packaging density as compared to the replaced packaging in a single shipment. Shipping frequency is reduced which leads to cost savings and lesser fuel consumption. The container is clean for immediate storage. We introduced a new packaging system that used environmentally friendly solutions. Firstly, the materials are returnable and recyclable. Secondly, we increased the packing capacity and eliminated the need for unpacking and repacking of products before it could be stored in the clean room. This returnable packaging can be flattened for storage and assembled again when needed. Through combining the packaging and material handling systems, we have helped our clients to increase the capacity of their packaging, therefore maximising their existing storage capability. This also cuts down on the time needed to pack and deliver their products to their customers. By maximising their packaging capacity, they could optimise their transport costs as they could ship a greater volume of goods with lesser frequency. This not only translates to bottom-line savings in freight costs but also creates a positive impact on the environment by reducing on their carbon footprint.